FCA knows where it sells the most trucks, and that's Texas. So it's rolled out a succession of special-edition pickups just for that state. And it's revealing the latest version at the Dallas-Fort Worth Auto Show this week. 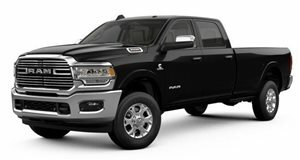 The new 2019 Ram Heavy Duty Lone Star builds on the recently revealed trucks, and gets a series of (mostly cosmetic) upgrades to appeal to the cowboys and girls in the state that not only ranks as the second largest and second most populous in the Union, but its largest single market for pickup trucks as well. The Lone Star edition (pictured in the three images above, looking outwardly identical to the Big Horn edition below) comes packed with loads of extra chrome on the grille frame, bumpers, and door handles. It also gets halogen (or optional LED) headlamps, special 18-inch (or optional 20-inch) wheels, and special Lone Star badges throughout. A trailer package comes as standard, including Class-V hitch and bigger side mirrors. Buyers will be able to choose between two special interior packages and four color combinations for the cloth upholstering the inside of the cab. An optional equipment group includes the 8.4-inch Uconnect touchscreen (among other enhancements) – but the choices don't end there. 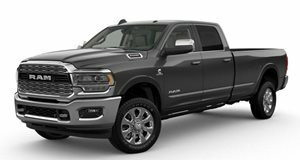 The Lone Star edition will be available in both 2500 and 3500 spec, with two- or four-wheel drive, in Regular, Crew, or Mega Cab, in two bed lengths, and with either the 6.4-liter Hemi V8 or the 6.7-liter Cummins turbodiesel with its headline-grabbing 1,000 lb-ft of torque. And there are Black and Sport appearance packages on offer as well. "First and foremost, the Ram Heavy Duty Lone Star edition is a powerful, hard-working truck that meets the demands of Texas truck buyers." Pricing starts at $37,645 (plus $,1695 destination) for the 2500 model and $39,095 (plus destination) for the 3500 version. You'll need to live in Texas to order one, but that won't keep Ram from selling them hand over fist: since introducing the first Lone Star edition in 2002, FCA's sold over 270,000 of them (like those pictured above and below), all in the one state.